The Outsourced Help Desk Service Level Agreement is used when you are contracted by another company to perform computer-related help desk functions. Covers issues such as installing software patches, system security (anti-virus and firewall software installations), data backups, networking issues, and more. This Outsourced Help Desk Service Level Contract is included in editable Word format that can be customized in Word or by using the included Wizard software. 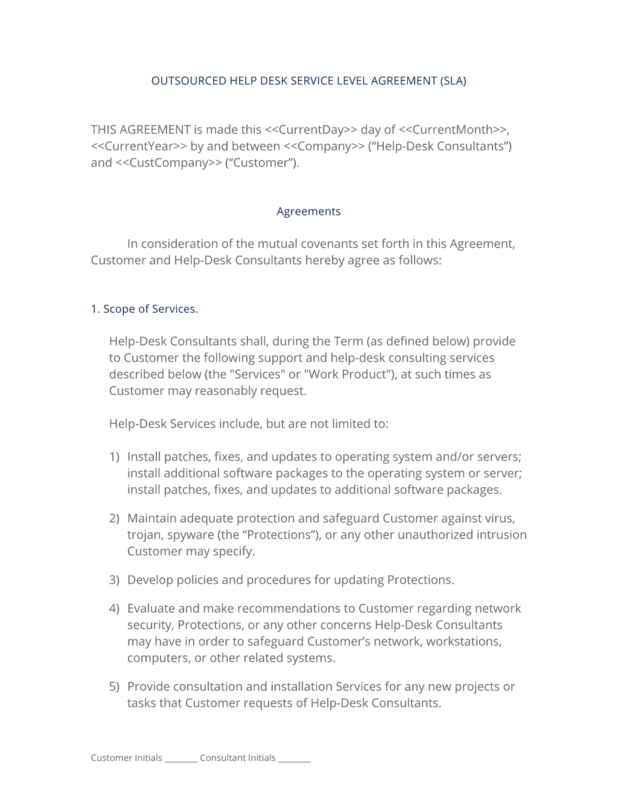 THIS AGREEMENT is made this Current Day day of Current Month, Current Year by and between Company Name ("Help-Desk Consultants") and Company Name ("Customer"). Help-Desk Consultants shall, during the Term (as defined below) provide to Customer the following support and help-desk consulting services described below (the "Services" or "Work Product"), at such times as Customer may reasonably request. Install patches, fixes, and updates to operating system and/or servers; install additional software packages to the operating system or server; install patches, fixes, and updates to additional software packages. Maintain adequate protection and safeguard Customer against virus, trojan, spyware (the "Protections"), or any other unauthorized intrusion Customer may specify. Develop policies and procedures for updating Protections. Evaluate and make recommendations to Customer regarding network security, Protections, or any other concerns Help-Desk Consultants may have in order to safeguard Customer's network, workstations, computers, or other related systems. Provide consultation and installation Services for any new projects or tasks that Customer requests of Help-Desk Consultants. Provide disaster recovery from backup and maintain a current file library of all software, licenses, records, or purchases Help-Desk Consultants have made for Customer, source code and maintain a history log or other record for Customer concerning all installations, upgrades, patches, or other Services performed for Customer. Offer general advice and guidance to Customer's employees or end-users, and make recommendations to Customer concerning their systems and software. Liaise with hardware engineers and customer support, or other Services or entities related to the maintenance and upkeep of Customer's systems and software. Provide up to two (2) hours of consultation with Customer every month in order to schedule any projects, set priorities, or discuss special needs that Customer may have. Liaising with billing and/or accounting on matters related to payment for software, licenses, Services, or other items unless directly provided by or acquired for Customer by Help-Desk Consultants. 24-7 monitoring of web site or web server status, unless otherwise specified and agreed upon in the specifications. Fixing errors and omissions contained in any third-party resource outside of the direct control of Help-Desk Consultants, unless otherwise agreed upon in the specifications. Help-Desk Consultants agree to perform the Services pursuant to the specifications set forth in Exhibit B attached hereto (the "Specifications"). This Agreement shall commence on Start Date and shall continue in full force and effect until terminated by either party upon at least ninety (90) days prior written notice. Absent a termination notice, no event (except breach) may terminate this Agreement prior to End Date. Upon termination of this Agreement, Help-Desk Consultants shall transfer and make available to Customer all property and materials in Help-Desk Consultants' possession or subject to Help-Desk Consultants' control that are the rightful property of Customer. Help-Desk Consultants shall make every reasonable effort to secure all written or descriptive matter that pertains to the Services or Work Product and agree to provide reasonable cooperation to arrange for the transfer of all property, contracts, agreements, supplies, and other third-party interests, including those not then utilized, and all rights and claims thereto and therein. In the event of loss or destruction of any such material or descriptive matter, Help-Desk Consultants shall immediately notify Customer of the details of the loss or destruction in writing and provide the necessary information for a loss statement or other documentation to Customer. Help-Desk Consultants shall have ownership to all Help-Desk Consultants' Material. (a) Materials that do not constitute Services or Work Product (as defined in Section 1, Scope of Services, and in Exhibit B, Specifications). (b) Materials that are solely owned by Help-Desk Consultants ("Pre-existing Works") or licensed to Help-Desk Consultants. (c) Materials that are incorporated into the Work Product or a part of the Services. (d) Additional materials shall include, but are not limited to: Insert additional material here. Help-Desk Consultants shall hold all rights, title, and interest in and to Help-Desk Consultants' Material. Customer shall not do anything that may infringe upon or in any way undermine Help-Desk Consultants' rights, title, and interest in Help-Desk Consultants' Material, as described in this paragraph 4. Notwithstanding the above, Help-Desk Consultants hereby grant Customer an unrestricted, nonexclusive, perpetual, fully paid-up worldwide license for the use or for the sublicense of the use of any Help-Desk Consultants' Material employed under this Agreement. For all of Help-Desk Consultants' Services under this Agreement, Customer shall compensate Help-Desk Consultants in cash, pursuant to the terms of Exhibit A attached hereto. In the event Customer fails to make any of the payments referenced in Exhibit A by the deadline set forth in Exhibit A, Help-Desk Consultants have the right, but are not obligated, to pursue any or all of the following remedies: (1) terminate the Agreement (breach), (2) immediately stop all Services, or (3) bring legal action. Rules governing work performed by the Help-Desk Consultants that is considered "onsite" shall be defined in Exhibit B. Rules shall include, but are not limited to: Availability of Help-Desk Consultants for visits, any required number of onsite visits for this agreement, defining provisions and responsibilities for Customer to accommodate onsite visits and any other related matters pertaining to work performed at Customer's location or locations. Customer and Help-Desk Consultants acknowledge and agree that the Specifications and all other documents and information related to the performance, production, creation or any expression of the Services or Work Product are the property of Customer. Materials shared between Help-Desk Consultants and Customer (the "Confidential Information") including, but not limited to, documentation, product specifications, drawings, pictures, photographs, charts, correspondence, supplier lists, financial reports, analyses and other furnished property shall be the exclusive property of the respective owner (the "Owning Party") and will constitute valuable trade secrets. Both parties shall keep the Confidential Information in confidence and shall not, at any time during or after the term of this Agreement, without prior written consent from the Owning Party, disclose or otherwise make available to anyone, either directly or indirectly, all or any part of the Confidential Information. Excluded from the "Confidential Information" definition is anything that can be seen by the public or has been previously made available by the Owning Party in a public venue. Help-Desk Consultants warrant the Services or Work Product(s) will conform to the Specifications. If the Services or Work Product do not conform to the Specifications, Help-Desk Consultants shall be responsible for correcting the Services or Work Product without unreasonable delay, at Help-Desk Consultants' sole expense and without charge to Customer, to bring the Services or Work Product into conformance with the Specifications. This warranty shall be the exclusive warranty available to Customer. Customer waives any other warranty, express or implied. Customer acknowledges that Help-Desk Consultants are not responsible for the results obtained by Customer when using any Services or Work Product produced by Help-Desk Consultants. Customer waives any claim for damages, direct or indirect, and agrees that its sole and exclusive remedy for damages (either in contract or tort) is the return of the consideration paid to Help-Desk Consultants as set forth in Exhibit A attached hereto. No action, regardless of form, arising out of the Services rendered or Work Product, under the Agreement, may be brought by either party more than one (1) year after the cause of action has occurred. In no event shall Help-Desk Consultants be held liable for consequential damages. Help-Desk Consultants are retained as independent contractors. Help-Desk Consultants will be fully responsible for payment of their own income taxes on all compensation earned under this Agreement. Customer will not withhold or pay any income tax, social security tax, or any other payroll taxes on Help-Desk Consultants' behalf. Help-Desk Consultants understand that they will not be entitled to any fringe benefits that Customer provides for Customer's employees generally or to any statutory employment benefits, including without limitation worker's compensation or unemployment insurance. Help-Desk Consultants agree to adhere to all of Customer's policies and procedures concerning code and conduct while on Customer's premises. Customer agrees to make available to Help-Desk Consultants prior to the commencement of this Agreement all manuals, codes, rules, and regulations that Customer requires Customer's staff or employees to read and/or sign. Help-Desk Consultants shall maintain throughout the entire term of this Agreement, adequate general liability insurance providing coverage against liability for bodily injury, death, and property damage that may arise out of or be based upon any act or omission of Help-Desk Consultants or any of their employees, agents, or subcontractors under this Agreement. Upon written request, Help-Desk Consultants shall provide certificates from their insurers indicating the amount of insurance coverage, the nature of such coverage, and the expiration date of each applicable policy. Help-Desk Consultants shall not name Customer as an additional insured on any applicable policy at any time during this Agreement, or as a condition of acceptance of this Agreement. Customer agrees to make available to Help-Desk Consultants, for Help-Desk Consultants' use in performing the Services required by this Agreement, such items of hardware and software as Customer and Help-Desk Consultants may agree are reasonably necessary for such purpose. Help-Desk Consultants will not be reimbursed for any expenses incurred in connection with the Services or Work Product, whether direct or indirect, without the express written approval of Customer. Rules governing expenses for work that is performed by the Help-Desk Consultants that is considered onsite shall be defined in Exhibit A. This Agreement shall be binding upon and inure to the benefit of Customer and Help-Desk Consultants and their respective successors and assigns, provided that Help-Desk Consultants may not assign any of their obligations under this Agreement without Customer's prior written consent. Help-Desk Consultants have no right to assign, sell, modify, or otherwise alter this Agreement, except upon the express written advance approval of Customer, which consent can be withheld for any reason. Customer may freely assign Customer's rights and obligations under this Agreement. In the event Customer fails to make any of the payments set forth on Exhibit A within the time prescribed in Exhibit A, Help-Desk Consultants have the right to withhold Services, remove Work Product from Consultant-owned resources, or seek legal remedy until payment is made in full, plus accrued late charges of 1 1/2% per month. Customer warrants that everything Customer gives Help-Desk Consultants in the execution or performance of Services, or the creation of any and all Work Product is legally owned or licensed to Customer. Customer agrees to indemnify and hold Help-Desk Consultants harmless from any and all claims brought by any third party relating to any aspect of the Services or Work Product, including, but without limitation, any and all demands, liabilities, losses, costs, and claims including attorney's fees arising out of injury caused by Customer's products/services, material supplied by Customer, or copyright infringement. Customer grants Help-Desk Consultants the right to use descriptive text, testimonials, performance metrics, and other images, photos, and/or graphics that demonstrate the Services or Work Product for promotional purposes, and/or to cross-link such items with other promotional resources developed by Help-Desk Consultants. Help-Desk Consultants have no responsibility for any third party taking all or any part of the Services or Work Product, results of Services or Work Product, or the improper use by any third party of any Services or Work Product produced by Help-Desk Consultants. Help-Desk Consultants have the exclusive rights in making any derivative works of any Services, methodology, or Work Product. Help-Desk Consultants are not responsible for any down time, lost files, equipment failures, acts of nature, or any damage resultant from activities considered beyond the control of Help-Desk Consultants, such as war, riots, natural disasters, vandalism, and other events. The parties represent and warrant that, on the date first written above, they are authorized to enter into this Agreement in its entirety, and duly bind their respective principals by their signatures below. The complete Outsourced Help Desk Service Level Contract - with the actual formatting and layout - is available in this Contract Pack.